Take A Break Vending provides fresh, healthy choices in food vending using the latest technology, convenient payment options, great monthly promotions, and exciting food selections—all at no cost up-front! Sick of mediocre food options? You'll love our fresh food vending choices! Featuring the best selection of fresh food meals, snack favorites, popular drinks, and the very latest vending machine technologies available, our vending machines take convenience to a new level. In addition, we offer Hispanic food selections and regional favorites to provide the best quality, most well-rounded options for at-work meals. By carrying a wide range of healthy, satisfying food choices at your site, there’s no longer a need to take time away from work to hunt for food. Fresh, healthy foods in stock at all times, prepared with the freshest ingredients. Rewards with every purchase, through the USConnectMe loyalty and rewards program. Instant Savings on a wide range of products through our ongoing monthly promotions. Availability of their favorite items through our constant remote monitoring of sales and maintenance status of each machine. Multiple payment options, which include Apple Pay, Google Wallet, the USConnectMe card, the USConnect App, and cash, debit, and credit cards. Our staff dietician ensures that the foods we offer your employees meet sensible nutritional guidelines through our health and wellness program, The Right Choice…for a Healthier You®. We help your employees make healthier eating choices by designating healthy selections with our apple/heart logo. And of course, making healthier choices impacts their performance at work as well as their overall well-being in life. Our equipment is placed at no charge; we simply collect the funds when we restock machines, which is done on a regular basis. A great option for companies who charge their employees for snacks (often at a lower cost). Upon stocking the machines and collecting the funds for the discounted purchases, we’ll then invoice you monthly for the balance due. Would you like to provide your employees with free snacks and beverages? We can help! Our free vending program provides all the great fresh food, snacks, and drinks each month, and we simply invoice you according to your re-stocking needs. You can count on us for all your vending needs. Looking for candy vending machines (only)? Beverage vending? Coffee vending? We have it all and can customize each machine to your preferences. 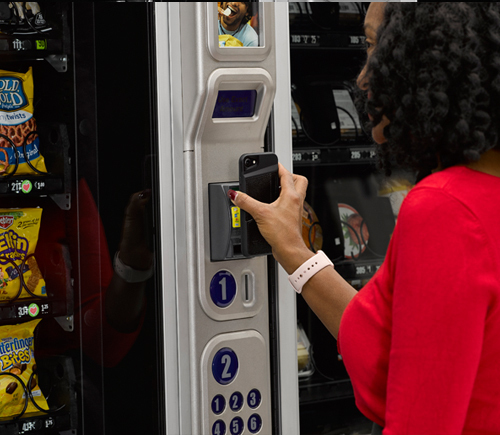 With all the Take A Break Vending vending options you can offer your employees, plus fresh food, loyalty rewards, and more ... what’s not to love?